The presentation and workshop draw attention to the way we learn in order to develop our understanding and achieve something in the world outside formal education, where our learning projects form around our needs and interests that rely on us being self-motivated, self-directed, creative and self-regulating. These attitudes and actions are embedded in processes that we create for ourselves, in particular situations and contexts. They are grounded in and emerge from the circumstances of our lives. They usually involve other people and the search for and use of information, knowledge and other resources from a variety of sources, that we filter, make sense of and use, in order to fulfil our goals. If we think about learning, development and achievement in terms of our active engagement, participation, action and effects in the world we inhabit then we might use the holistic idea of 'ecology' to represent the dynamics of this process. We might also create a simple tool to help us explore the extent to which these sorts of processes are present and supported in our educational designs. The workshop provides an opportunity for thinking, conversation and discussion about the value and potential use of these ideas, and an opportunity to imagine new designs that are more supportive of this holistic ecological perspective on learning, development and achievement. A teacher's ecology to enable her students to learn and develop. It embraces her own attitudes, beliefs knowledge and capability, and those of her students, her pedagogic and cultural contexts, the spaces she and her students inhabit and creates, the relationships she draws upon, the resources and tools she uses and creates and the processes she creates for teaching and students learning. An example of students' self-determined, self-directed, self-regulated learning in the context of a planning, preparing, implementing and sustaining a volunteering project in Uganda. 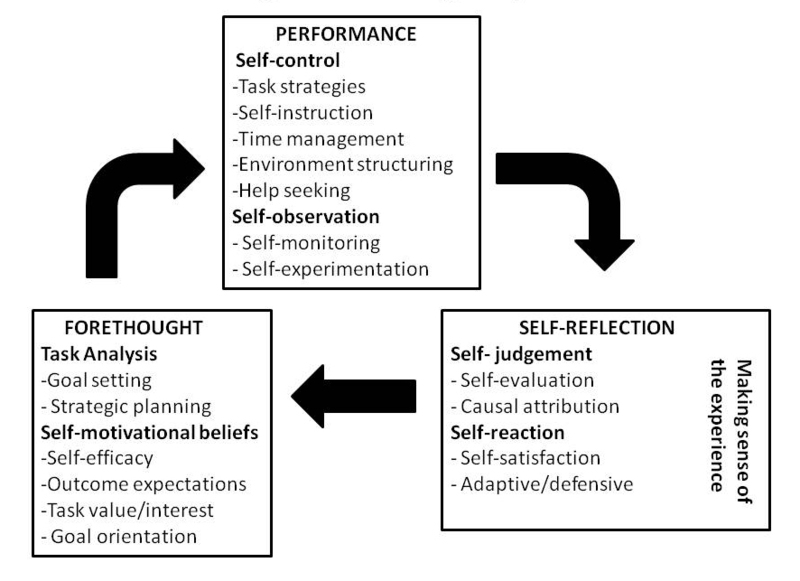 An analysis of the leaders self-regulatory behaviour is given below together with a representation of the elements of theself-regulation theory (Zimmerman 2000). In this story the students reveal how they created an ecology for learning, development and achievement.